Preventing nonstate actors from acquiring and using weapons of mass destruction is among the most important responsibilities of the international community. The nuclear security summits, the International Convention for the Suppression of Acts of Nuclear Terrorism, and the close engagement by [the Security Council] on allegations of chemical weapons use have all played an important role in keeping us safe. Yet in our rapidly evolving global security environment, gaps will continue to open. We have seen the rise of vicious nonstate groups with no regard for human life. They actively seek weapons of mass destruction, I am sure, and these weapons are increasingly accessible. We have seen this in the use of chemical weapons by Da’esh [the Islamic State group] in Syria and Iraq. There are legitimate concerns about the security of large stockpiles of weapons-usable fissile material outside international regulation. Scientific advances have lowered barriers to the production of biological weapons, and emerging technologies, such as 3-D printing and unmanned aerial vehicles, are adding to threats of an attack using a weapon of mass destruction. We must also beware of the growing nexus between weapons of mass destruction, terrorism, and cybersecurity. Malicious actions in cyberspace have real-world consequences. Nonstate actors already have the capacity to abuse cyber technologies to create mass disruption. The nightmare scenario of a hack on a nuclear power plant causing uncontrolled release of ionizing radiation is growing. To stay ahead of this technological curve, the international community needs robust defenses that are nimble and flexible. Preventing a weapon of mass destruction attack by a nonstate actor will be a long-term challenge that requires long-term responses. A biological attack would be a public health disaster. Yet, there is no multilateral institutional response capability. The council also has a role to play in holding those that use chemical or other inhumane weapons accountable. There can be no impunity. This is a complex web of global threats and risks that requires a sophisticated global response. We must take advantage of every opportunity to strengthen our collective defenses. In this regard, the Biological Weapons Convention Review Conference was, in many ways, disappointing. I count on all states to work together to prevent potential disasters, and I count on this council to lead. In closing, let me emphasize that it is not simply a case of letting these weapons fall into the wrong hands. There are no right hands for wrong weapons, and weapons of mass destruction are simply wrong. There is only one sure way to prevent terrorists from acquiring weapons of mass destruction—that is their complete elimination. We live in a world that is overarmed, a world where peace is underfunded. I urge all states to fulfill their commitment to building a world free of all weapons of mass destruction. 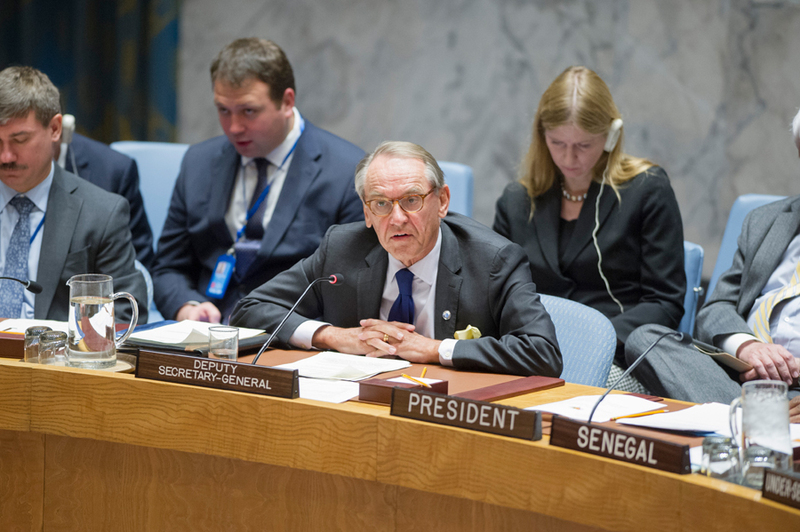 Jan Eliasson was deputy secretary-general of the United Nations from July 2012 until December 2016. This piece is adapted from his December 15, 2016, remarks to the UN Security Council during its debate on stopping the proliferation of weapons of mass destruction by nonstate actors.